Our riding holidays are a minimum of three nights or more, many guests stay for a week or even two. 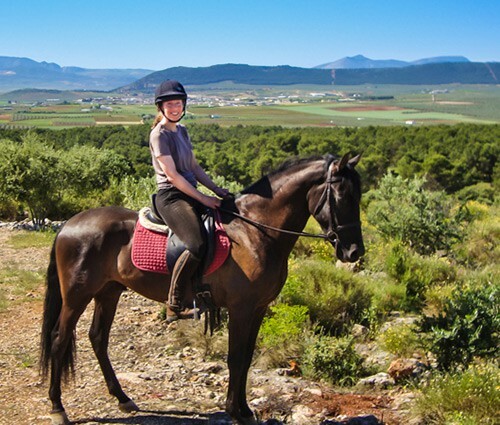 We are passionate about giving you the very best possible horse riding holiday in Spain. We speak Spanish and English and so do our friendly male and female guides. 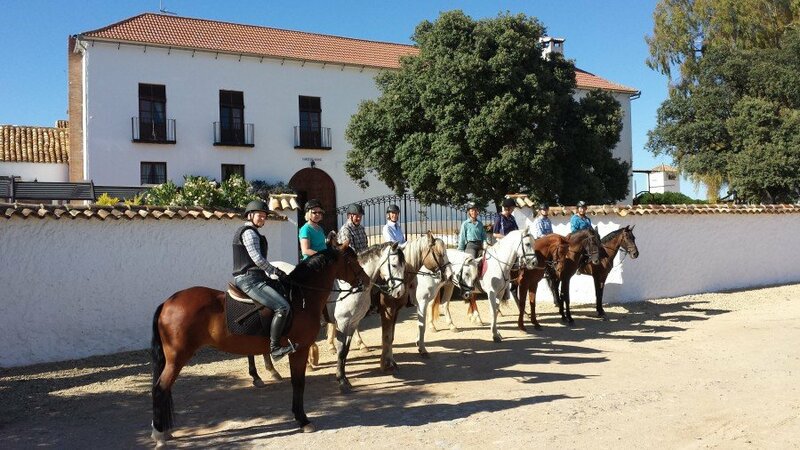 We believe flexibility is the key to an enjoyable horse riding holiday, and as such we do not run a strict itinerary. We will do our best to accommodate your wishes. Whatever you decide to do there is no traffic so you can just enjoy your ride, the amazing weather and the spectacular views. Currently we have a maximum weight limit of 100kgs for our riders. Its best to fly to Malaga airport, we can either collect you or you can catch the train. It costs €110 return per car between 9am and 7pm and outside these times there is a €30 supplement. You can catch the train to Antequera, Santa Anna and we’ll pick you up from the station €40 return. See below transfer details. Once you have settled in you will be given a short riding assessment with your instructor. We ask you what goals you want to achieve from your riding holiday. For example you might want to simply improve your riding skills, just enjoy the hacking or try some new dressage. Breakfast with a selection of fruits, cereals & pastries with juice, coffee and tea to set you up for the day ahead. Dinner ~ Relaxing in the starlight on the patio or by the warmth of the fire in the Chapel. In the hotter months we change our riding schedule to avoid peak heat periods. Summer also gives us many more riding options as the crops are removed from the fields which give us many more long canters to enjoy. We tend to split riders into ability groups for hacking and lessons as some riders are happy to be in the saddle all day, but for others this maybe too long. We can offer additional one hour lessons by sympathetic and professional trainers. Just let us know what you are hoping to achieve and we will do our best to help you accomplish them. 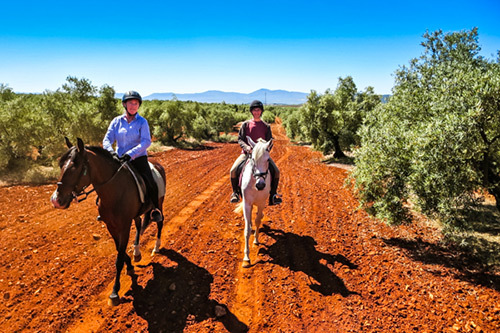 A scenic four hour ride to Santianne, walking through the gentle olive groves and cantering across the endless plains of the Campo to higher vantage points to admire the breathtaking Andalulsian countryside. 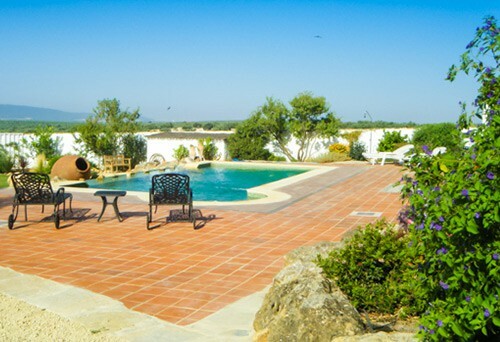 We stop for a Spanish picnic al fresco, before a return journey alongside the vineyards. On the picnic rides all food is included. During May, June, September and October, on the nights of the full moon we ride at night by the light of the moon. Approximately a two hour ride, we stop for refreshments and to admire the scenery illuminated by the full moon. An amazing experience to ride through the Campo surrounding by darkness and stillness of the shimmering night – did you know you get shadows at night! A stunning two day riding trip that follows the route of an Adalucian folk hero Jose Maria El Tempranillo. He was a local bandit in the early 19th Century who was very similar to the English Robin Hood, robbing the rich to give to the poor. We pass locals towns of Alameda, Carcoya and Badalatossa. Visiting natural springs and a monastery where El Tempranillo sheltered. Stopping at Jauja, for a night in typical rustic accommodation of the village entertained by Sevilliana music and dancing. 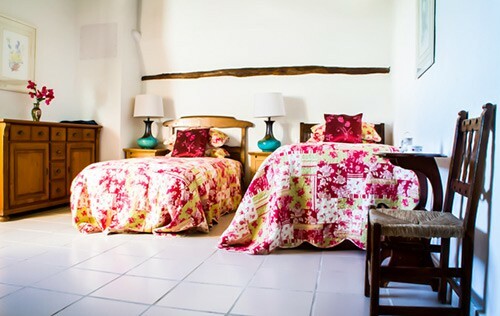 We will rise early and visit the museum of Jose Maria, whilst a local guide explains the history and special stories of the village. We travel back to the Cortijo via Benemaji, and make our way through the village back to La Posada El Tempranillo; here we will stop for local refreshment and photo opportunity, before heading back to Cortijo Uribe. Itinerary may need to be changed from time to time at the discretion of the management.